Ponta Malongane Holiday Resort is only a 30 minute drive from the border at Kosi Bay and about 7 km from Ponta do Ouro, set in subtropical Mozambique right on the beach. A place where heaven meets earth. Southern Mozambique is a nature lover's paradise and is known for its abundant bird life, especially the fish eagle. Turtle night drives are conducted under the auspices of the Turtle project. Between October and February you are escorted to egg-laying sites, where relevant data is explained and recorded for conservation purposes. 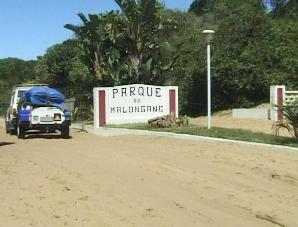 The sixteen reefs in the Malongane area offers you a wide variety of dives. Experience the wonders of Bass City or the more challenging shark dive, with lots of game fish and rays at the Pinnacles. 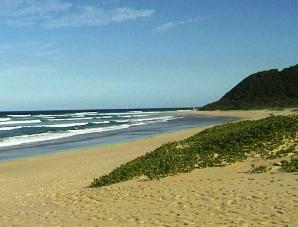 For student divers Ponta Malongane boasts a number of shallow reefs such as Texas and Padi. Non divers can just go along for a scenic ride and experience the wonders of sea life such as dolphins and turtles. The bar at the dive camp is well renowned in the area for its social atmosphere and view of the magnificent Malongane bay. Enjoy true Portuguese cooking at its best on the terrace of the Fish Eagle Restaurant with the sea as background music or inside with its relaxed atmosphere. Adjoining the Fish Eagle Restaurant is the Loggerhead Bar where you can enjoy an ice-cold beer while making new friends, just relaxing or enjoying a game of pool. The resort also boasts The Kanimambo Shop where basic essentials and fresh bread can be purchased. Kanimambo means grateful or thank you in Shangaan. Accommodation has been tailored to suit your needs and varies from 2 to 6 bed, self-catering units. Some have en-suite bathrooms and fully equipped kitchens including fridges. The secluded and shady camp area is situated just behind the dunes adjoining the beach. Plug points are provided and the ablutions have both hot and cold water showers. Accommodation is also available at the at the dive camp, consisting of wooden huts with twin beds and communal ablution facilities. Two man dome tents with mattresses under shade are also available. The dive camp boasts a spacious fully equipped self-catering kitchen. Fridge space is allocated to all guests staying in the dive camp.